Recruitment in football is crucial. It puts millions of pounds at risk to acquire the best talent. Clubs have large recruitment departments filled with scouts and analysts. Good recruitment is the difference between clubs that succeed or suffer. Financial power doesn’t guarantee success. For example, West Ham have experienced poor recruitment over the last few seasons despite ranking 17th in the Deloitte Money League. Financial Investment in Potential Growth (FIPG) is a great recruitment strategy in my opinion. Used by clubs with financial power, but not the ability to compete with the best in Europe. It’s the cheapest way to get top players and able to make large profits. The premise is to invest heavily into scouting, buying young players at the lowest possible price who the club believes has strong potential. The players can eventually be sold to larger clubs for a large profit. Obviously, that’s a perfect scenario. It is a risky strategy that needs excellent scouting and coaching to find and develop players. But, there are clubs who have carried it out very well. AS Monaco is an example of this. They beat oil-rich Paris Saint-Germain to the French title last season. Monaco had an extremely young squad, proving that you can win silverware with youth. 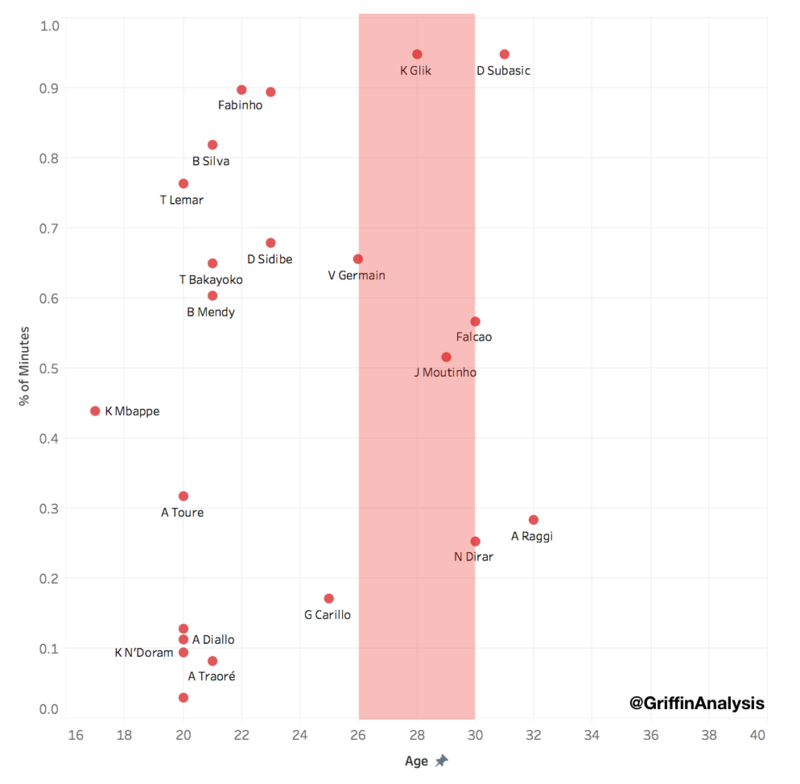 The Age Utility Matrix shows the youth in their title-winning squad. At the end of their great season, they sold a lot of key members of their squad. Mostly young players moved on, such as Mbappé, Bakayoko, Bernardo Silva and Mendy. In the image below, you can see all the young players that Monaco have bought in the past 5 seasons. Their recruitment team has bulk bought exciting young prospects. They have mainly brought in players from France. But, they’ve also invested in players from South America, Portugal and Belgium, among others. You can also see that many investments are small. Risk management is important in a club’s decision making. Monaco’s three most expensive investments were all this season, Tielemans, Pellegri and Keita. Monaco have also proven that with their system and scouting network they’re able to find great young talent and hidden gems, allowing them to buy at low prices. Then allowing for large profit potential, or if they player fails to develop as hoped they’re not making a large loss. For example, buying Anthony Martial for just £4.5 million. 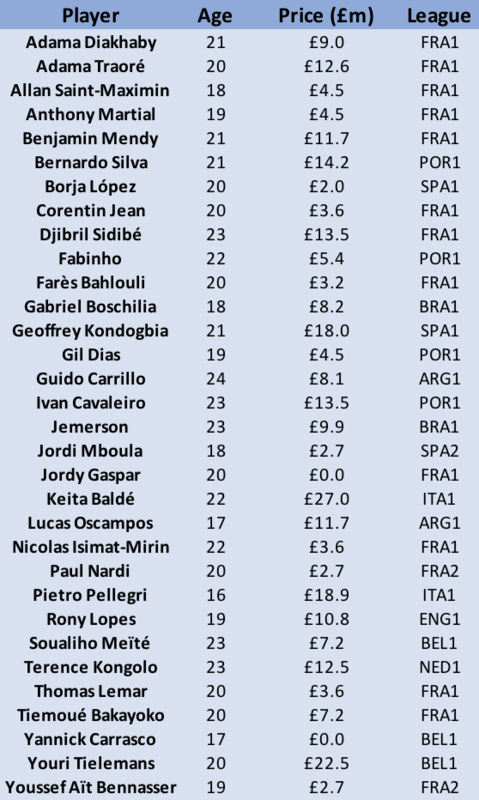 Monaco have made roughly £184 million in profit from the players in the list above that have been sold. Making a loss on just three players that were sold. A lot of the rest are on loan now or playing in the first team squad. Gaining a return on investment of 284% on these players below. As well as the silverware and success they’ve helped bring to the club. I also added how many Ligue 1 minutes they played for Monaco. Showing that they had large parts in Monaco’s success. These players also don’t spend much time at the club. These players were all still young when they left. Moving to bigger clubs after showcasing their talent in France and Europe. AS Monaco don’t only invest in players to come straight into the first team. They also have an accredited youth academy. Their Academy Director, Bertrand Reuzeau, was previously at eleven years before moving to Monaco. They have produced a new superstar, Kylian Mbappé, and have exciting players right now such as Adrien Bongiovanni, Irvin Cardona and Moussa Sylla. Monaco are an exciting club to follow to see the next big names in European football. They currently sit comfortably in 2nd with their young squad. Their Champions League campaign was less successful as they came bottom in a tough group, failing to get a win.